SpaceX continues to make progress on numerous fronts as they move forward to developing a set of flight capabilities which could enable a return to flight for U.S. astronauts. Pad 39A is one of two launch sites used for the former Space Shuttle Program that sat idle until NASA put the site up for lease. SpaceX and Blue Origin both competed for the rights to use the facility – with SpaceX eventually being approved to utilize the iconic site. 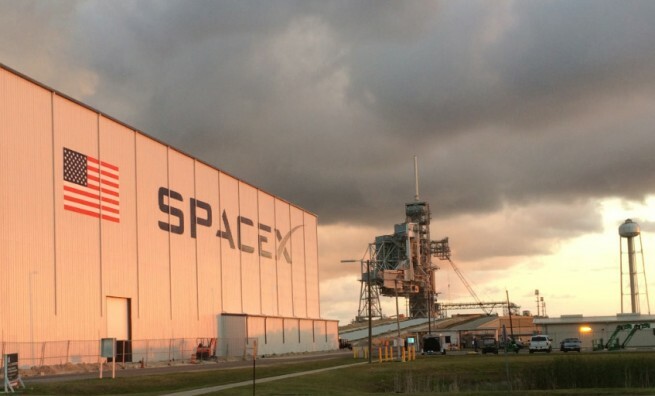 SpaceX has signed a 20-year lease for use of Kennedy Space Center’s Launch Complex 39A and they have wasted little time in getting it converted for Falcon Heavy and Falcon 9 launches. Work began on the Horizontal Integration Facility (HIF) with the driving of piles into the soft Floridian earth in late 2014. Since then The steel framing and beams have gone up and have been covered with a sheet metal skin. The finished HIF structure is approximately 285 feet (87 meters) long, 120 feet (37 meters) wide and 55 feet (17 meters) tall. After the doors were installed a few months ago, they have remained closed as workers continue to complete the inside or the building, outfitting it with the mechanical equipment needed for rocket assembly. Additional work at the facility included the installation of rails traversing the distance from the pad to the HIF. The flame trench has been resurfaced in preparation for the explosive forces they will have to endure whenever a the Falcon leaves the pad. Workers have also installed the large kerosene tanks and plumbing needed to fill SpaceX’s rockets with the massive quantities of fuel needed to loft up to 117,000 pounds (53,000 kilograms) of payload into low-Earth Orbit (LEO). Recently, the NewSpace firm conducted a test rollout of the transporter/erector strongback used to move the rocket from the HIF to the launch pad carried out a test rollout to adjacent LC-39A. Elements of the shuttle program will remain in place as SpaceX has said it will not remove the Fixed Service Structure (FSS) or the Rotating Service Structure (RSS) any time soon. The first test of the facility will occur when a Falcon Heavy is rolled out to the pad for a Wet Dress Rehearsal (WDR). The WDR is designed to test all of the various operations of the launch vehicle and ground support operations – including fueling of the vehicle. This is one step short of the static fire tests that SpaceX performs before every launch. After the WDR, SpaceX plans a static fire test and analysis before their first demo launch of the Falcon Heavy sometime in 2016. The actual launch date is contingent upon SpaceX returning to flight after the loss of the CSR-7 flight to the International Space Station (ISS) in June of this year. While work at Pad 39 continues, SpaceX has completed, the development testing of the SuperDraco rocket engines. This system is designed to push the Dragon capsule clear of the Falcon 9 should anything go wrong during flight and if an abort is needed. Working with four sets of two engines each, the hypergolic motors provide 120,000 pounds (54,430 kilograms) of force to accelerate the capsule from 0 to 100 miles (160 kilometers) per hour in about 1.2 seconds. 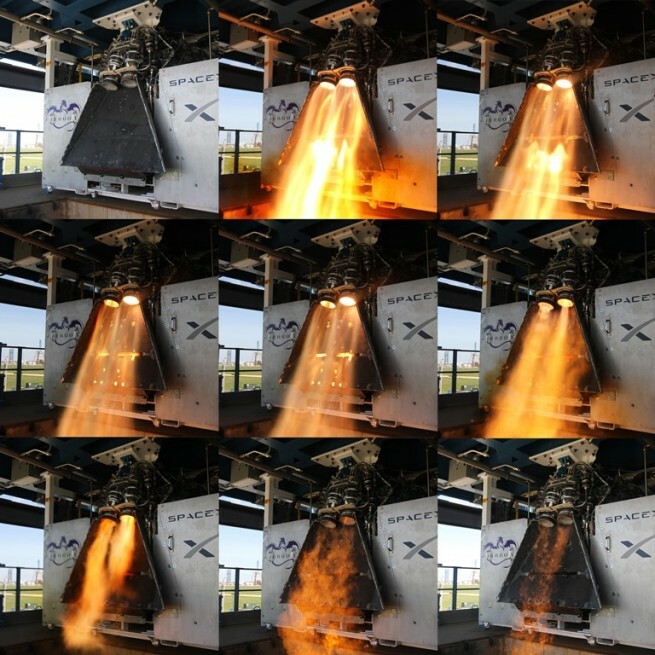 SpaceX tested the SuperDraco system on May 6 of this year during a pad abort test of the Crewed Dragon vehicle. Using a custom-crafted launch pad, a test version of the Dragon was launched using only the SuperDraco rocket engines. The SuperDraco motors burned 4,000 pounds (1814 kilograms) of hydrazine, a hypergolic fuel, in less than 6 seconds sending the capsule to nearly 5,000 feet (1,524 meters) before the vehicle’s parachutes opened and returned the craft safely to a splashdown in the Atlantic Ocean. The use of hypergolic fuels allows the engines to have a rather robust and reliable ignition. Hypergolic chemicals ignite on contact with each other virtually guaranteeing they will function. The downside to the chemicals is that all known hypergolics are toxic and require special handling to prevent serious injury to the ground crew. Throughout the space program, the use of these materials has been a balancing act of crew safety versus vehicle performance. Since the SuperDraco motors would primarily be used in the event of an abort scenario where crew safety could be compromised, the use of hypergolic fuels is more than justified. SpaceX and Boeing are both working on crewed vehicles under NASA’s Commercial Crew Program (CCP). CCP is a multi-phase program designed to transition LEO operations for crewed spaceflight to the private sector – freeing the U.S. Space Agency to begin exploration missions into deep space. Good luck to the SpaceX team. Already driving piles for HIF in 2014, when pad 39a agreement wasn’t yet signed until Apr 2015? Really? Also, note photo caption says launch in 2015. Should be 2016. I see agreement was Apr 2014, not 2015. Got it. The picture caption above says Falcon Heavy poised to fly this year from an article in January. Joe’s article says 2016. I am wondering if it is ready yet or the work was slowed down until after the three launches to the end of the year. Is it waiting for possible tweaking from flight data before final assembly? Between January and June 28, 2015 – SpaceX lost the CRS-7 Falcon 9. It was slowed due to that. The SuperDracos are described in the second-to-last paragraph as ONLY intended for use during an abort. SpaceX has indicated that it intends to use them for powered landings on a pad (like what they’re attempting with the first stage) once it’s passed an appropriate certification.